Vancouver, Canada – April 11th, 2019 – Unity Metals Corp. (the “Company”) (TSXV: UTY) is pleased to announce that the Company has acquired an additional 739 hectares of mineral claims in the Phillips Arm Gold Camp, where gold exploration and production began in the 1800’s. These additional claims are known as the Enid Project, and adjoin the Company’s Margurete Gold Project. The claims comprising the Enid Project have been intermittently explored since the 1890’s with at least 5 historic adits (Empress adit, Empress shaft, No.2 adit, parts of the Juliet adit/ shaft, and the All’s Up adit) on the claims. Since the 1980’s the claims have been intermittently explored with ground geophysics, soil sampling, outcrop mapping and sampling, as well as an airborne VTEM survey, the latter in 2008. 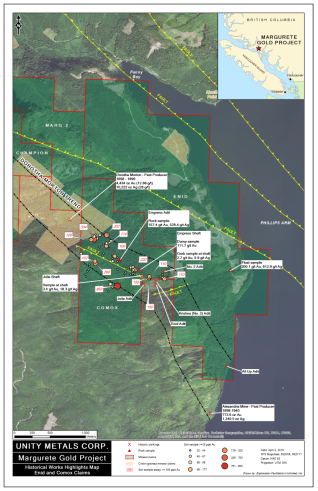 With these additional claims, the Company now controls 1947 hectares of prospective gold claims in the project area and has added another 2km of the Dorotha Morton Mineralized Trend/ Shear Zone. Spamprotection Please add 14 and 4. » more news from Unity Metals Corp.